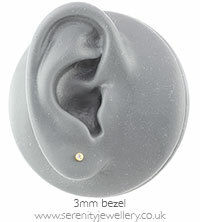 Hypoallergenic golden titanium stud earrings inset with Swarovski crystals with titanium butterfly backs. 8mm earrings (excluding light rose) have Blomdahl push-up butterfly backs which have a plastic surround to help support larger size earrings. The crystal size is the diameter of crystal visible (the bezel setting/surround holds part of the crystal which therefore cannot seen). The Blomdahl size refers to the total diameter of the earring and is the size shown on the label. I chose crystal with gold tone, to match some of my other jewelry and am really pleased with these studs. Very easy to wear for everyday and look great. What's more: no allergic reaction, so one very happy bunny! Very pretty earrings which daughter loves wearing. They do not irritate her ears at all. Intend to purchase another pair in a larger size. First pair of earrings I’ve been able to wear in years. I can’t even wear gold or solid silver. I’ve worn these continuously since they arrived, sometimes even overnight. I’m over the moon, superb quality. Delivery was quick and service excellent. This is another pair of titanium earrings I got from Serenity Jewellery and I love them! great quality and fast shipping! 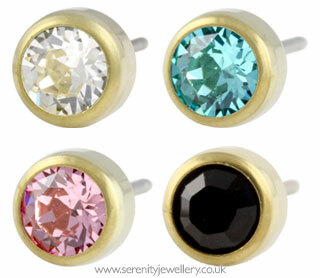 This is a great feel good versatile earring and it goes with everything! Beautiful rainbow color which add just the right amount of color! Very good. I will carry on to buy this kind of things if I want other colours. My first pair of earrings for 20 years. Not only are they are classy little stud but after 2 days of 24/7 wear and they are still very comfortable. I had to give up on earrings after I became very allergic - my ears reacted badly to everything I could buy in the shops. I assumed they had closed up but they had not. I stumbled across this site and thought I'd give Blomdahl a go. 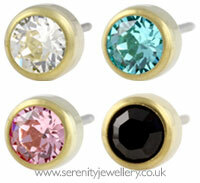 The service from Serenity has been first rate - very prompt emails and delivery. I will be back for more styles very soon!